Posted on Fri, Feb 24, 2012 : 3:48 p.m.
INDIANAPOLIS — Michigan State quarterback Kirk Cousins was an unheralded recruit coming out of Holland Christian, but turned out to be one of the best quarterbacks in Spartans history. He said Friday at the NFL Scouting Combine that it is difficult for him to rank those accomplishments, but didn't deny that going 4-0 against rival Michigan holds a special place among them, particularly when considering the Spartans had lost their previous six games in the series. Quarterback Kirk Cousins says going 4-0 over state rival Michigan is among the highlights of his college career. Cousins said he'll remember being there to help Michigan State "turn a tide" against the in-state rival. "It’s hard to rank them, because all the accomplishments are special in their own way, but to beat Michigan once, to beat them four times in a row, it's very special and it was big for our program," Cousins said. "(It) says a lot about our program, the direction Coach (Mark) Dantonio is taking the Michigan State football program, but then also specifically our senior class and the job we were able to do in our four years there." Cousins said whenever Michigan week rolled around, he would get a text from Brian Hoyer, a former Spartans quarterback who now backs up Tom Brady with the New England Patriots. The text would remind Cousins what was on the line: A yearly bet between Hoyer and Brady, in which the loser would have to wear his rival's colors. Cousins never let Hoyer down, after concluding his career with a 28-14 victory against the Wolverines last year. It was Michigan's first loss of the season. "It’s completion," receiver B.J. Cunningham said of last season's win against Michigan. "It completed the circle for us seniors and, hopefully, the young guys keep ... that beat going." Cunningham also noted that it was "icing" for him that Michigan State sent more players (six) than Michigan (three) to this week's combine in Indianapolis. "That keeps the streak going a little bit," he said. Cunningham, on his relationship with Michigan receiver Junior Hemingway: "I kick it with Hemingway, he’s a good dude. We been in some rooms together, just hanging out." Cousins, on returning to Indianapolis' Lucas Oil Stadium for the first time since losing here in the Big Ten championship game against Wisconsin: "(It) was a bittersweet moment. You think about how close we were to a Rose Bowl, and how close we were to a second consecutive Big Ten championship, and the way we fell short, it was tough. ... At the end of the day, it was two great football teams, and one of them was going to lose, and unfortunately, it was us." Tue, Feb 28, 2012 : 7:20 p.m.
UofMbebetter makes a great point...I don't see any Michigan fans apologizing or making excuses for beating the ONLY 7 loss team in Ohio State history. In fact, Michigan fans made history by rushing the field after beating a 6-5 team. For every excuse you make about being DOMINATED by MSU balance it with not taking much credit for beating OSU. For all of the posts that I've seen from overjoyed UM fans since November 26th, I have yet so see a single one that said &quot;we just beat a mediocre team&quot;. NOT ONE! With respect to October 20th UM vs. MSU at Ann Arbor I have little question that MSU will dominate that game. The defense will be even better than 2011. We get back injured 6'7&quot;, 290 lb DE Tyler Hoover (Big 10 D player of the week vs. Northwestern in 2010). The MSU offensive line and running game will be better than 2011. The MSU offensive line loses one starter and returns 4 + 2 that started early in the season before injuries. Le'Veon Bell and Larry Caper will be dominating RBs in 2012. Caper started several games as a true freshman and scored the OT TD to beat UM in 2010. Bell is OUTSTANDING! Our outstanding punter and PK return. The only issue is the passing game. Michigan doesn't have one and MSU won't need one to beat Michigan. However, Maxwell is going to be excellent. WR Benny Fowler returns after missing 2011 with Injury and Dion SIms will be an excellent TE. We have 6 other WRs who are ready to play including Tony Lippett and Tennessee transfer Arnett. Molk and Martin were the heart and soul of the UM offense and defense in 2011. They are gone. Your defense is not as big, strong and athletic as the MSU defense...not even close. I don't know where these lofty expectations come from but I think that you guys are deluding yourself. The MSU defense will lose a lot of players after the 2012 season. You may have a chance in 2013 in East Lansing...repeat &quot;may&quot;. In the meantime, dream on! Tue, Feb 28, 2012 : 7:06 p.m. Sat, Feb 25, 2012 : 6:50 p.m.
No big deal. Most decent to good B1G teams beat us 3 years in a row when whatshisname was here. I give MSU credit for beating us in 2011, but you almost have to put an asterisk in the record book the previous 3 games: 2008-2010: MSU 3-0* vs UM (* due to the WCiMFH) Kirk, the part you said about UM beating you the previous 6 years ... get used to that again. Go Blue ! Sat, Feb 25, 2012 : 6:15 p.m. Sat, Feb 25, 2012 : 12:24 p.m. I take no insult from what they said. They were merely reflecting on the last 4 years. They told no lies or spewed no smack talk. Actually I've always liked Kirk, and if you have ever heard him speak, he is intellegent and mature. It dosen't matter what we could post as excuses, Mich State owned us the last 4 years. It is Hoke and staff's job to right the ship. I am confidant we are on our way. Congrats to Kirk, B.J. and company, good luck in the pros. Sat, Feb 25, 2012 : 10 a.m.
Is it cool that we beat The Ohio Even though they had an Interim coach and a true frosh at the helm and it was their worst team in a half century? We still beat them.... Right? Just wondering hoow many stats we should sort thru before being happy about a win. Sat, Feb 25, 2012 : 2:32 a.m.
Fri, Feb 24, 2012 : 11:51 p.m. I'm not even going to read this article. I just want to vote thumbs down on it even being written. Fri, Feb 24, 2012 : 11:34 p.m.
We cannot use the &quot;worst Michigan team in history&quot; excuse, because of these reasons. 1. We began every season ranked ahead of the Spartans in any poll. 2. Our recruiting classes were ranked at least 8 spots above in every publication. 3. The players prior to RR coming here were still more highly rated than almost any from MSU. 4. We've had a early season (September) Heisman's 4 seasons straight. (Until the regular season) 5. RR cannot totally be blamed for every loss against sparty, what about the 2011 season in which we went 11-2, plus a BCS Bowl win over VTech. Now it is a true and utter fact that RR was the worst hire in our history, but if we can erase the current losses because of him....what about MSU's last coach. He went to one bowl, just like RR. He also brought in the vaunted &quot;spread&quot; that was supposed to rack up points and countless wins. He was poor at &quot;PR&quot; and game management too, so did that mean that it was an excuse....heck no, we won and were proud of it. Though, I believe we had a lot of lucky bounces in our magical season, there's no doubt that Brady Hoke has us going in the right direction. Sparty, there's no excuses, you own us right now but we'll be back!!!!!!!!!!! Fri, Feb 24, 2012 : 10:43 p.m.
Fri, Feb 24, 2012 : 10:36 p.m.
What good will beating Michigan 4 years in a row when he is in the NFL doing his best Drew Stanton impersonation, as some team's 3rd string QB? If and when Drew Stanton gets a chance to play he will make the most of it. I'd compare Cousins to Drew Brees career in the BIG but Drews played in a pass happy offense. Nobody wanted Brees either. 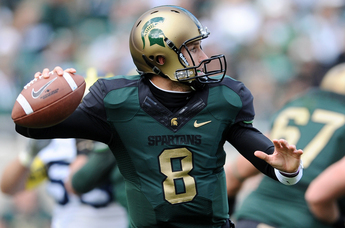 Cousins and the MSU offense put on one hell of a show in Indy on December 3rd. MSU averaged 7.5 yard per play vs. the BADgers that night. Both BJ and Keshawn had 100 yard games. Bell outplayed Montee Ball (who was stoned after a 100 yard first quarter). The game was UM vs. OSU in 2006. As Kirk said one great team had to lose. MSU outgained UW by 150+ yards. The Spartans made a few more mistakes and lost just like UW made a few more mistakes and lost in East Lansing. The turning point of the game was a bad call by the officials early in the 3rd quarter. UW was 3rd and one at the MSU 40. Jerel Worthy perfectly timed the snap and grabbed Ball for a 6 yard loss as Ball lateralled to Wilson who was swamped for an 8 yard loss. UW 4th and 9 and punting from the MSU 49. But wait...the officials missed it. Worthy was ruled offsides and it was first and ten for UW at the MSU 35. The Spartans then pushed the BADgers back 7 more yards to make it 3rd and 17 from the MSU 42. Wilson then ducked a corner blitz by MSU CB Johnny Adams and threw a high arching pass to Aberderius in the endzone makeing the score MSU 29 UW 28. People will remember the running into the kicker call; but this was the play that changed the game and gave UW some hope after MSU had gone on a 22 point run during the second quarter. Anybody here who does not understand how outstanding both UW and MSU were in 2011 wasn't paying attention. UM was VERY, VERY lucky not to have to face the BADgers once; much less twice. IMO, MSU was the slightly better team than UW because our better defense. If Russell Wilson doesn't end up at UW the Spartans are in Pasadena, hands down! Congrats to UW for an outstanding season as well. UM overachieved as MSU had in 2010. MSU will be excellent again in 2012. Sat, Feb 25, 2012 : 9:59 a.m. So memories of a great time mean NOTHING to you? Additionally $650,000 Drew made last year Thats 16.25 times as much money as a guy making 40k per year $12,500 weekly pay check. Chubby little Pension I dont know what Drew has made in his career for holding the clipboard, but if i had the opportunity to do an impression of Drew i would quit my job tomorrow and do it. Fri, Feb 24, 2012 : 10:11 p.m. Someone tell me this. Give me all the M classes that were 4-0 or 3-1 vs MSU and they did a story about it. It's never happened and that tells you all you need to know about MSU. Sat, Feb 25, 2012 : 12:17 a.m.
ummm, WE did this story. Not them. Fri, Feb 24, 2012 : 10:05 p.m. Sat, Feb 25, 2012 : 12:25 a.m.
That's exactly what Hoke was hired to do, and exactly what he's been doing with this program. Not bad going 11-2 when he didn't even have everything in place the way he wanted it. Things are only looking up! Fri, Feb 24, 2012 : 9:22 p.m. I give it to ya Kirk ya whipped our butts 4 yrs in a row and if I was you I'd brag to. I hope you do well in the pros. you deserve some time on the clock in the pros but don't make the mistake of thinking that just because you beat the worst team in Michigan wolverine history that you'll do well in the pros. You will have to work for every thing you get in the pro's, you will not face any teams like Michigan the last 4 yrs. rebuilding, in transition and firing and getting rid of 2 coaches that no longerger fit the system of high standards which Michigan although rebuilding is back to. Kirk, I know you will always be interested in that Mich. vs State game just like Tom Brady is but I think starting the 2012 season your going to see a much higher caliber Wolverine team, the kind you never had to face in your tenure. You did a good job Kirk, congradulations. Sat, Feb 25, 2012 : 9:41 a.m.
Fri, Feb 24, 2012 : 9:49 p.m. I'll be honest: I'd take Cousins over Denard as a QB. Since Denard wears the maize &amp; blue, he's the one I root for, but let's not hate on Kirk either.